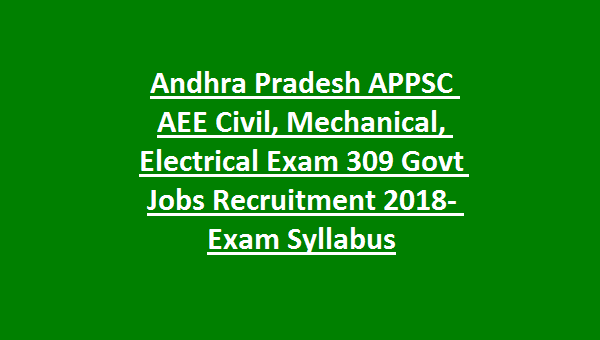 APPSC AEE Recruitment/Exam Notification-2018: Andhra Pradesh Public Service Commission APPSC is set to release the AEE jobs (ఆంధ్రప్రదేశ్ అసిస్టెంట్ ఎగ్జిక్యూటివ్ ఇంజనీర్) in various engineering departments of AP State. There are more than 309 vacancies are in this APPSC AEE (ఆంధ్రప్రదేశ్ అసిస్టెంట్ ఎగ్జిక్యూటివ్ ఇంజనీర్) Exam Notification 2018. Available engineering departments are Civil Engineering, Mechanical Engineering, Electrical Engineering, and Agriculture Engineering. 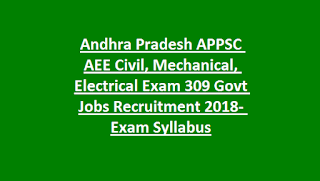 Candidate’s selection for this APPSC AEE Recruitment of AEE Civil or AEE Electrical or AEE Mechanical or AEE Agriculture vacancies will be based on prelims or screening exam and mains exam. B.E or B.Tech in Civil Engineering or Electrical Engineering or Agriculture Engineering or Mechanical Engineering they are eligible to apply online for this APPSC Asst Executive Engineer jobs. Apply online from 03-12-2018 to 24-12-2018 via APPSC official website of psc.ap.gov.in for this APPSC AEE Notification 2018. AEE Exam pattern, AEE Exam syllabus, salary, APPSC application fee, qualification and other details for this APPSC AEE recruitment exam notification 2018 is given below. There are total 309 AEE posts are in this APPSC various engineering departments notification. AEE posts age limits are 18-42 years as on 01-07-2018. For reserved candidates 5 years of age relaxation is applicable. Computer Degree or Degree with Computers Diploma having candidates they are only eligible applying this APPSC AEE jobs Revenue dept notification. For AEE posts salary is Rs.25000 to Rs.50000/- per month. Refer notification for application/Exam fee for AEE jobs. Screening test or prelims exam (Prelims will be conducted only if applications are more than 25000) and Mains exam will be held for this APPSC AEE jobs. Exam Pattern and Syllabus details for AEE Civil/Electrical/Mechanical/Agriculture jobs will be updated after releasing the notification by APPSC. Screening test will be conducted for 150 questions and 150 marks. Online applications only accepted for this AEE jobs notification. Official website to apply online is psc.ap.gov.in for this APPSC AEE notification.